Kodiak Cakes pumpkin spice cake layers with toasted marshmallow filling. Tender and moist pumpkin spice cake layers with toasted marshmallow filling and cinnamon spice frosting. 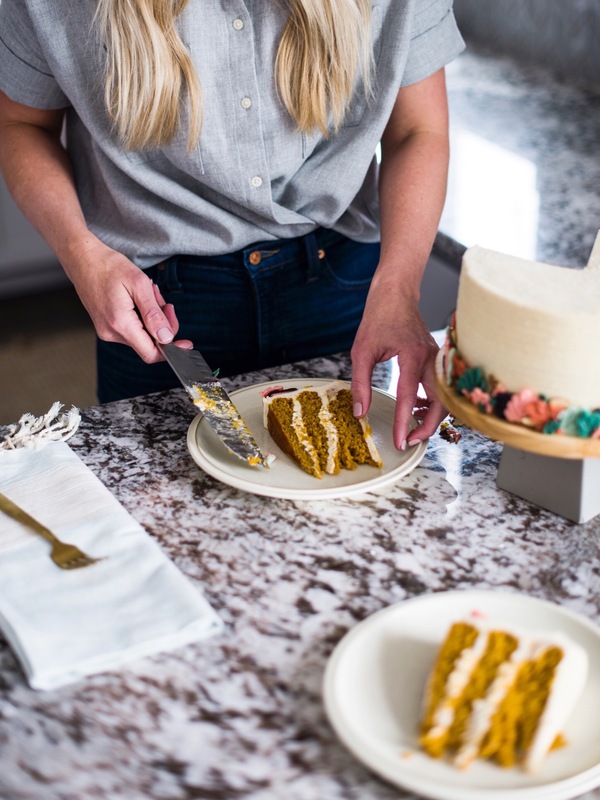 If I didn’t tell you, I’m fairly confident you’d have no idea this pumpkin cake with toasted marshmallow filling and cinnamon spice frosting is made with a pancake mix. Yup, you read that right – pancake mix! 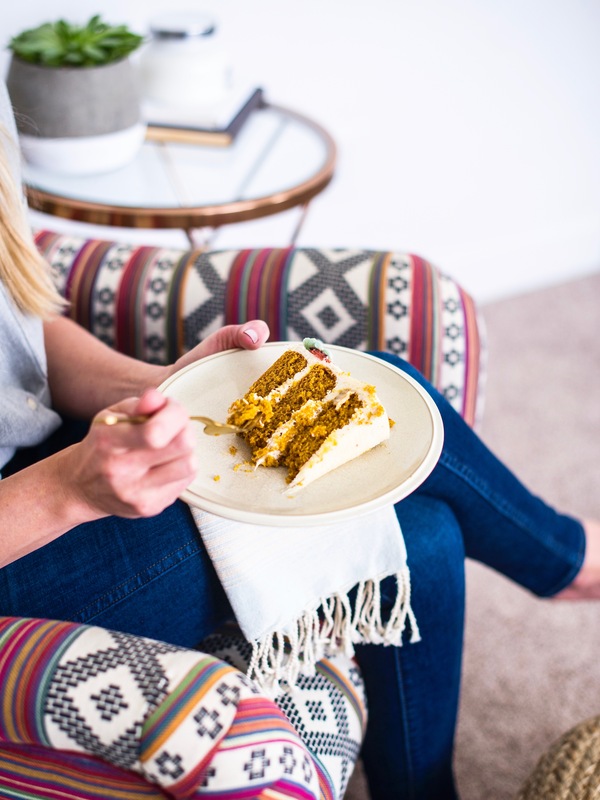 In fact, I actually didn’t tell Ryan and Westin that this new pumpkin cake has Kodiak Cakes Energy Cakes Pumpkin Flax Pancake Mix in it until after they devoured a couple slices. It’s just as good as any of my other cakes! 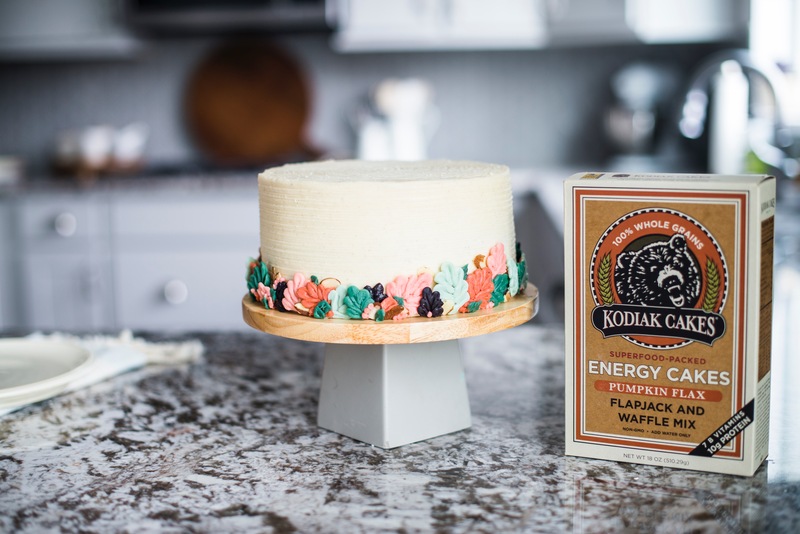 The idea for this cake came after Kodiak Cakes challenged me to come up with a cake using one of their mixes. I love a good challenge when it comes to baking and knew exactly what I wanted to make once I saw their new pumpkin mix. Before I got baking, we whipped up the pancake mix as pancakes to see just how much flavor the mix has on its own – which is quite a bit. Knowing I didn’t need to add a lot of spices to the cake, I got started on figuring out exactly how much pancake mix would work in a cake, without tasting like a muffin. I used my go-to pumpkin cake recipe as a base, and at first, subbed all the flour for the Kodiak Cakes pancake mix. I also used less sugar and less spices. The flavor of the first round was great but the texture was off. It was definitely more of a muffin-like texture, and I knew I needed to try again. No cake of mine is going to taste like a muffin! In round two of my experimenting, I cut the pancake mix to two cups instead of three and used one cup of all-purpose flour. I also took out a little baking powder from the original recipe, as well as a little more sugar so that I’d get a really nice rise to my cakes. (Sometimes, too much baking powder and/or baking soda, along with too much sugar, can actually cause your cakes to sink. So, when I’m having trouble with my cakes rising nicely, I usually cut back on sugar first and then look at how much baking powder and baking soda I’m using). The cake layers from round two baked beautifully and tasted incredible. They came out moist and tender, and oh-so flavorful! I couldn’t have been happier with them. Next came the filling and frosting. I’ve been dying to try Sweetapolita’s toasted marshmallow filling I use in my Ultimate S’mores Cake with pumpkin cake. 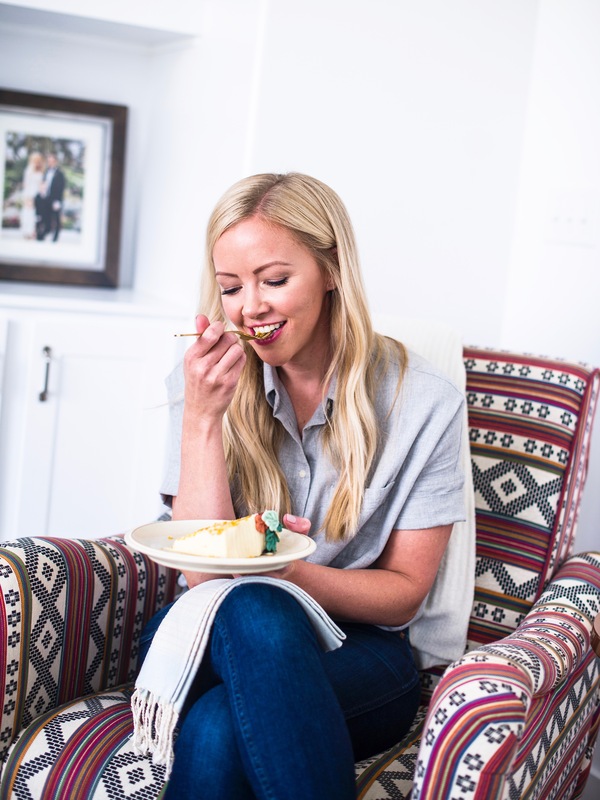 They feel like a match made in heaven, and with one bite of this cake, you’ll agree that they absolutely are! For the buttercream, I used Lorann Oils Cinnamon Spice Emulsion and just a hint of ground cinnamon. The flavor isn’t too overwhelming, but pairs nicely with the cake and filling. I absolutely love how this cake came together and I think you will be too. It was a big hit with my family and friends and will make the perfect Thanksgiving dessert! 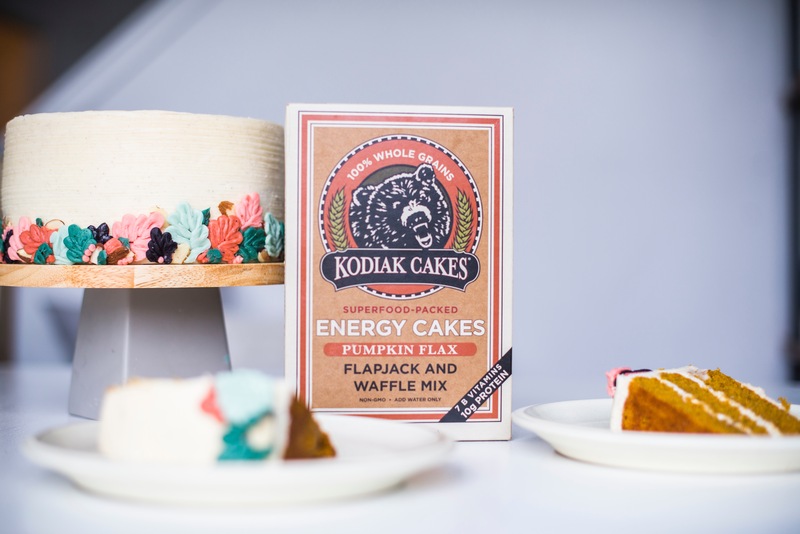 A big thank you to Kodiak Cakes for their fantastic products and sponsoring this post. Preheat 350 degrees F. Spray three 8-inch round cake pans with cooking spray and line the bottoms with parchment paper rounds. Spray again and then set aside. In the bowl of an electric mixer fitted with the paddle attachment, beat the sugars (granulated and brown) and eggs together on medium-high speed until light and fluffy, about 5 minutes. Add the oil and vanilla and beat on medium until combined, about 30 seconds. Add the pumpkin puree and mix until combined, about another 30 seconds. In a medium bowl, whisk together the flour, Kodiak Cakes Pumpkin Mix, baking powder, cinnamon, ground ginger, nutmeg, and salt, and with the mixer on the lowest speed, gradually add to the pumpkin/egg mixture. Add the heavy cream, one tablespoon at a time. Once the cream is incorporated, add the emulsion and cinnamon and increase the speed to medium-high and beat the frosting for five minutes. It should get lighter in texture and color. Place the first cake layer on a cake board and top with about 1 cup toasted marshmallow filling. Repeat with the second cake layer and another cup of toasted marshmallow filling. Place the final cake layer on the marshmallow filling, top-side down. Apply a thin coat of the cinnamon spice buttercream around the cake to lock in the crumbs and chill for 10 minutes in the freezer to set. Finish frosting the cake with the cinnamon spice buttercream. What if you do not want to buy the cinnamon emulsion? How should I adjust the spice? I’d add a little more cinnamon. It might be good to specify as sugars* so people know to add both brown and white sugar. It also would have been to nice to have an assembly instructions noting the buttercream, filling, and cake/finishing touches. Super yummy though! Thank you for your feedback. I can totally do that. 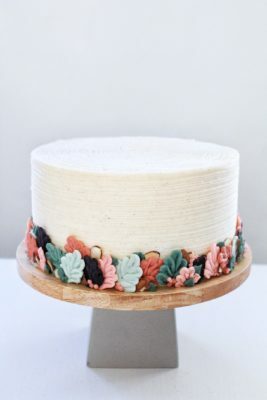 How did you get that beautiful texture in the buttercream? Love this cake! 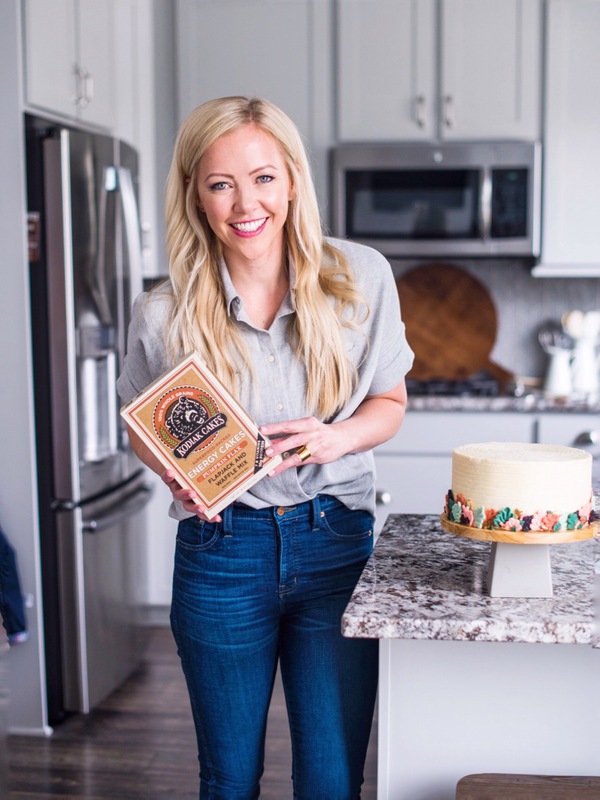 Always a family favorite- it was actually my first cake recipe of yours I ever tried 🙂 For the buttercream I’m wanting to make it more of a cinnamon spice cream cheese buttercream….how would you modify the recipe? Would you just replace the unsalted butter with 2 cups of cream cheese? No, don’t replace all the butter with cream cheese. That will be too overwhelming. I would follow my cream cheese frosting recipe – just search cream cheese frosting on my site.